Note: The Canon EF 35mm f/2 Lens has been replaced by the Canon EF 35mm f/2 IS USM Lens. The Canon EF 35mm f/2 Lens is a tiny, light and inexpensive Canon lens. It turns out to be a good performer as well making this lens a good value. Build quality on this 35mm prime lens is reasonable. A metal lens mount contributes to the 35 f/2's overall quality. The focus ring is small, but certainly easier to use than the front-mounted focus ring on the even less-expensive Canon EF 50mm f/1.8 II Lens. The non-USM autofocus drive motor is noisy (buzzy), but autofocus is reasonably fast. FTM (Full Time Manual) focus is not available. My Canon EF 35mm f/2 Lens tended toward over-exposing on many shots. I don't know if this is a copy-dependant trait or a general trait of this lens. Depth of field (DOF) at f2.0 is rather shallow if you are close to your subject - accurate focus is critical (unfortunately, I don't find the 35 f/2 to focus as accurately as the better Canon lenses). The short DOF benefit is that you can blur the background nicely. Unfortunately, the bokeh quality on the 35 f/2 stopped down is not excellent. 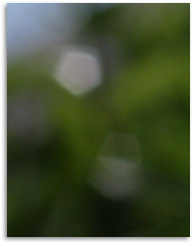 When stopped down, OOF (Out Of Focus) highlights appear as pentagons due to the 5-blade aperture (as can be seen in the sample above). OOF highlights will be round if you shoot wide open - which is also when highlights will most likely be out of focus in the first place. Contrary to what some others report from this lens, I found contrast to be slightly lacking on my copy. My 35 f/2 shots generally had a very-slightly washed out appearance requiring a boost of saturation/contrast. Pictured above from left to right are the Canon EF 35mm f/2.0 Lens, Canon EF 50mm f/1.4 USM Lens, Canon EF 35mm f/1.4L USM Lens, Canon EF 16-35mm f/2.8L USM Lens and the Canon 24-70mm f/2.8L USM Lens. In the center sharpness department, the Canon EF 35mm f/2 Lens is quite good at f2.0. Sharpness increases slightly as the aperture is stopped down through f/4 or so. Center sharpness is one of the 35 f/2's strongest points. However, corner sharpness is really bad (even on a 1.6x FOVCF body through f/5.6 or so). The 35 f/2 exhibits strong vignetting until stopped down to at least f/2.8. The 35 f/2's vignetting at f/2 is similar to the Canon EF 35mm f/1.4L USM Lens vignetting at f/1.4. The vignetting will be much less of an issue to 1.6x FOVCF Digital SLR body users. The 35 f/2 scores very well in the distortion department. I found the 35 f/2 to hold its own in the center sharpness comparison with the Canon EF 35mm f/1.4L USM Lens, however the 35 L was far better in the corners. The f/1.4 produced a smoother image and had slightly better color than the f/2. At similar apertures, the 35mm f/2 is similarly sharp in the center to my Canon EF 24-70mm f/2.8L USM Lens at 35mm. However, the 24-70 L was much sharper in the corners even on a 1.6x FOVCF body. At similar apertures, the Canon EF 35mm f/2 Lens was clearly sharper than my Canon EF 16-35mm f/2.8L USM Lens at 35mm. The difference narrowed to very little by f/4. The minimum focus distance of the Canon EF 35mm f/2 Lens is .8'. While not a 1:1 macro lens, the Canon 35 f2.0 focuses quite closely. At this distance, flower and plant photography is a use for this lens. Keep in mind that you need a pleasing wide background as 35mm will include a lot of it in your shot. The 35mm f/2 can be useful for landscape photography if 35mm is the focal length that is right for you. Full body portrait photography is another good use for this lens. I don't recommend using a 35mm focal length lens for much closer portrait work (such as head shots) because body features (including noses) tend to get exaggerated. That said, this lens can be ideal for loosely cropped full body portraits - especially in limited space situations. Low available light portraits and other similar casual and formal shots are another of the situations the 35 f/2's handles well. Shooting with a handheld camera indoors after dark is doable with this lens. The relatively wide focal length paired with a fast f/2.0 aperture makes the 35mm f/2 a good handheld indoor available light (without flash) lens. If you decide to use a flash, the 35 f/2 will not block an onboard camera body's flash. Use this lens to capture the family gathering or your child's birthday party. The 35 f2 is useful at church or school. 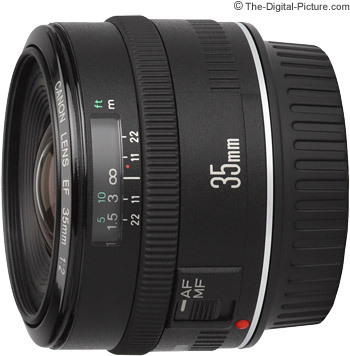 With a very low purchase price, the Canon EF 35mm f/2 Lens could make a nice affordable general-purpose lens. When mounted on a Canon camera with a 1.3x or 1.6x FOVCF, the result is near the classic normal 50mm lens - a lens that many people have used exclusively for years. The Canon EF 35mm f/2 Lens is a nice lens - Sharpness, size, weight and price are its best features. I don't recommend this lens for full frame body users.